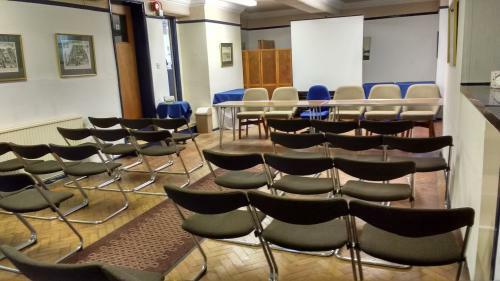 We have a large multi-use meeting room, measuring 5m x 20m. 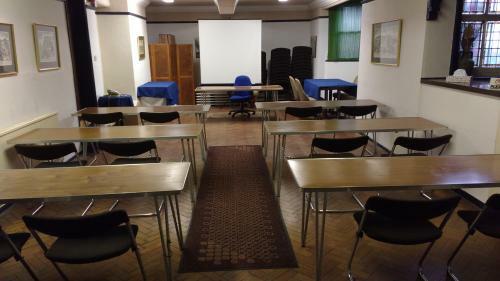 With a parquet flooring and low ceiling, the room is suitable for lecture layout (36 chairs), classroom layout (6-8 tables with 12-16 chairs), or boardroom style (24 chairs). Special rates are given to customers of the hotel on a residential package for your delegate, or else book by the half-day, day, or evening. If possible it is recommended to visit the hotel to view the meeting room and facilities in person before making a definite booking. Refreshments including tea/coffee, water, biscuits or sandwiches, available throughout the day, as required. More specialised catering may be available on request. There are power points at the head of the room for electrical devices - laptops etc. We can provide a 36" flat screen TV or projector screen. Other equipment can be arranged through a local audio/visual company on your behalf. The room is on the sub-basement - windows look across the garden and lawn and there are steps down from the car park as well as main lobby. You can arrange direct access from the front of the hotel if required. Please note that with steps/stairs to the hotel and meeting room doors, this may not be suitable for disabled access. Meeting room floor is polished parquet with a mat runner along the middle. Toilet facilities are upstairs. We have a residents' car park at the back of the hotel and would be able to allocate a number of spaces for your use - delegates would need to register vehicles at reception on arrival. 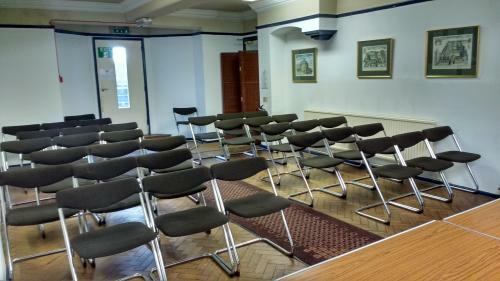 For an idea of the meeting room furniture and layout have a look at our website. Make an enquiry online or email us for more information.